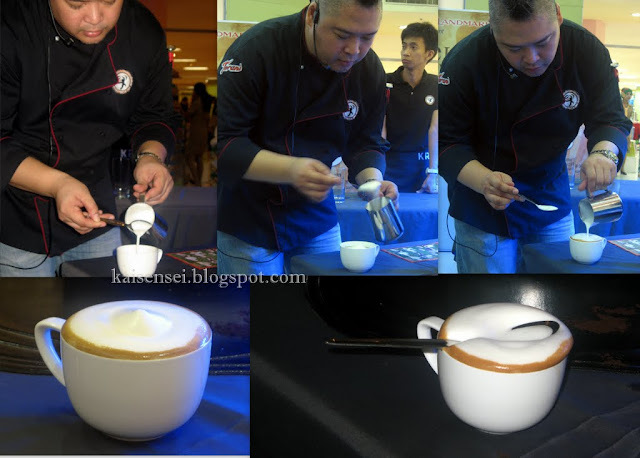 Just before I left for Roxas City and Boracay last October, I received an invite to attend LATTE LOVE - A Coffee Art Workshop sponsored by KRUPS. I was really saddened though coz the date of the event was scheduled during the time I was out of town. So I was really happy when I found out that there was another workshop that was going to be held at TRINOMA Landmark. I jumped at the chance and immediately signed up for it. I had a feeling that Brew of The Day at LATTE LOVE A Coffee Art of Workshop = Perfection!!! So COFFEE ART. Have any of you coffeeholics have ever heard about it? I LOVE COFFEE. I think its absolutely divine! 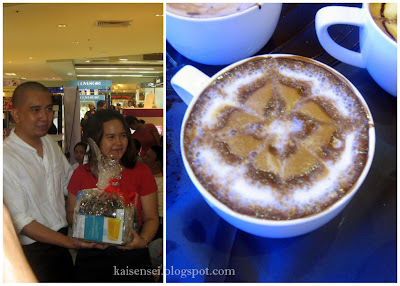 Though most of my coffee experience has been more on then popular commercial side, the only time I encountered coffee art was when one of my favorite baristas put KAI on my coffee drink using chocolate syrup. I thought it was the coolest thing ever coz I felt real special! And basically, that's what coffee art is all about! The Coffee is used as a canvass, while the milk and chocolate syrup served as the paint. So our venue was in front of this HUGE Christmas tree in Landmark Activity Center. It was the background of the whole workshop making everyone feeling the Christmas spirit in the air. The smell of coffee brewing stimulated our senses. 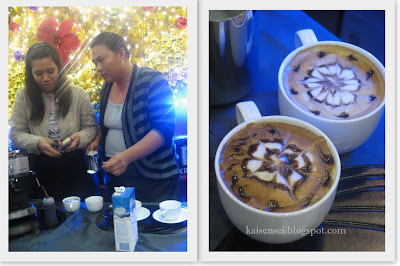 I couldn't wait to see what this Latte Love Coffee Art Workshop had in store for us! Of course the main star of this event was this KRUPS Espresso Machine. With this machine at home, you can your very own barista! Ahhh if only I could take one home.. hehe. The workshop was facilitated by Chef "Mike" -- Michael Ross Canlas. He is a Barista Instructor/Trainer at the Philippine Barista and Coffee Academy (wow I had no idea that there's such a thing.. A COFFEE ACADEMY sounds super cool!). He is also a part-time owner and F&B Manager at Route 196 and Marjj. He then proceeded to show us his masterpieces with the help of two champion Baristas - Adlher Miko Simangan and Kevin Israel Fortu, both from Lyceum of the Philippines. So how to make good coffee that's just perfect for Coffee Art? First you must have the right ingredients! Can't make Coffee Art without its most essential ingredient right! Chef Mike couldn't express how important FRESH MILK must be used to make this work. And some Chocolate Syrup to make his wonderful Coffee Art Creations! Chef Mike demonstrates how one should pour the milk or "crema" to create this canvass. Frothing or steaming the milk is very important to get the latte look frothy and fluffy like that! 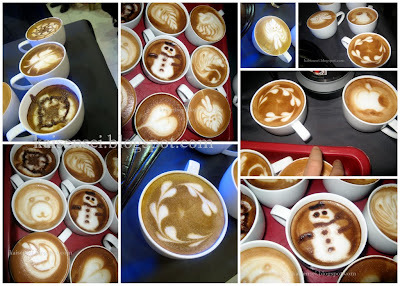 And here are some of his creations using just the milk and strategic pouring of the crema to create this awesome works of art. I would find it difficult to drink my cup of coffee with those designs on it coz its too pretty! My favorite - the Snowman! Perfect for the Christmas season.. plus all that chocolate -- Yummy! Yes they made a lot of art in a very short amount of time! Amazing! Members of the audience were also given a chance to try making some Coffee Art. Just watching them made it look easy. I felt that I could probably make some of the designs on the coffee as well. But after watching the participants try their hand at it, di pala ganun kadali! It looks easy but it takes patience, a steady hand, and precision! Here are some of their works. Their designs and attempts weren't as perfect as the Chef and his assistants but they still did an amazing job! 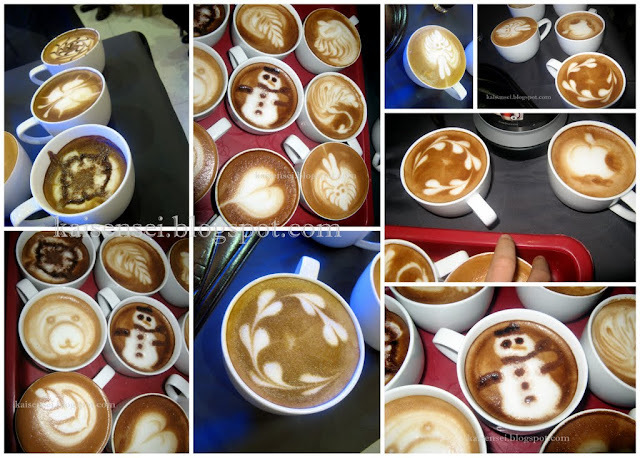 Here are some of the participants attempting to make coffee art. I think they did a pretty good job! The coffee art flowers look lovely! Each participant got a gift from Krups and additional extra special gift for the participant who made the best coffee art design! Here is the winning piece! After the workshop, Chef Mike then proceeded to demonstrate how to make homemade crushed iced drinks that could rival the commercial ones out there! I really had a fun time at the workshop. There was also an ongoing raffle and I won a gift pack from Meadow Lea Fresh Milk. Thank you Krups and Meadow Lea! My sister drank it all up. Anyway, I had wanted to show you all a photo with me in it, but since I was just by myself when I went to this workshop so no pictures with me in it. Anyway, I still enjoyed my time there and learned a lot. Thank you once again Krups for inviting me to this event! Now don't forget to drop by KRUPS and check out their latest promos. I don't know about you guys but a Krups Coffee Maker or Espresso Machine would be a great Christmas gift! 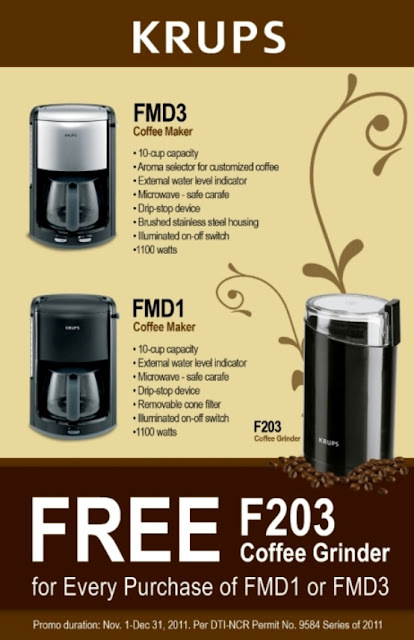 You can also get a FREE COFFEE GRINDER upon purchase of KRUPS FMD3 Coffee Maker or FMD1 Coffee Maker. Don't Forget to drop by KRUPS FACEBOOK to check out their latest promos and updates!